Request a quote for a bulk order for 5-hydroxymethylcytosine (5-hmC) polyclonal antibody (rabbit) - Classic. Please fill out the form here below. Your local sales account manager will get in touch with you shortly and send you a quotation based on your requirements. Polyclonal antibody raised against 5-hydroxymethylcytosine (5-hmC). 5-hmC is a recently discovered DNA modification which results from the enzymatic conversion of 5-methylcytosine into 5-hydroxymethylcytosine by the TET family of oxygenases. Preliminary results indicate that 5-hmC may have important roles distinct from 5-methylcytosine (5-mC). Although its precise role has still to be shown, early evidence suggests a few putative mechanisms that could have big implications in epigenetics. 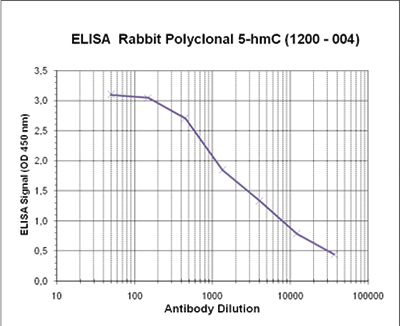 To determine the titer, an ELISA was performed using a serial dilution of the Diagenode rabbit polyclonal antibody directed against 5-hmC in antigen coated wells. The antigen used was BSA coupled to the 5-hmC base. By plotting the absorbance against the antibody dilution, the titer of the antibody was estimated to be 1: 3,500. Figure 2. An hydroxymethylated DNA IP (hMeDIP) was performed using the Diagenode rabbit polyclonal antibody directed against 5-hydroxymethylcytosine (Cat. No. CS-HMC-100). The IgG isotype antibodies from rabbit (Cat. No. kch-504-250) was used as negative control. The DNA was prepared with the GenDNA module of the hMeDIP kit and sonicated with our Bioruptor® (UCD-200/300 series) to have DNA fragments of 300-500 bp. 1 μg of human Hela cells DNA were spiked with non-methylated, methylated, and hydroxymethylated fragments. The IP’d material has been analysed by qPCR using the primer pair specific for the 3 different control sequences. The obtained results show that the Diagenode rabbit polyclonal for 5-hmC is highly specific for this base modification (no IP with non-methylated or methylated C bases containing fragments). 100 to 4 ng (equivalent of 5 to 0.2 pmol of C-bases) of the hmC, mC and C PCR controls from the Diagenode “5-hmC, 5-mC & cytosine DNA Standard Pack” (Cat No. AF-101-0002) were spotted on a membrane (Amersham Hybond-N+). The membrane was incubated with the rabbit 5-hydroxymethylcytosine polyclonal antibody (dilution 1:200). The membranes were exposed for 30 seconds. 5-hydroxymethylcytosine (5-hmC) has been recently discovered in mammalian DNA. This results from the enzymatic conversion of 5-methylcytosine into 5-hydroxymethylcytosine by the TET family of oxygenases. So far, the 5-hmC bases have been identified in Purkinje neurons, in granule cells and embryonic stem cells where they are present at high levels (up to 0,6% of total nucleotides in Purkinje cells). Preliminary results indicate that 5-hmC may have important roles distinct from 5-mC. Although its precise role has still to be shown, early evidence suggests a few putative mechanisms that could have big implications in epigenetics : 5-hydroxymethylcytosine may well represent a new pathway to demethylate DNA involving a repair mechanism converting 5-hmC to cytosine and, as such open up entirely new perspectives in epigenetic studies. Due to the structural similarity between 5-mC and 5-hmC, these bases are experimentally almost indistinguishable. Recent articles demonstrated that the most common approaches (e.g. enzymatic approaches, bisulfite sequencing) do not account for 5-hmC. The development of the affinity-based technologies appears to be the most powerful way to differentially and specifically enrich 5-mC and 5-hmC sequences. The results shown here illustrate the use of this unique monoclonal antibody against 5-hydroxymethylcytosine that has been fully validated in various technologies. Diagenode strongly recommends using this:	5-hydroxymethylcytosine (5-hmC) polyclonal antibody (rabbit) - Classic (Diagenode Cat# C15310210-100 Lot# A1204-004). Click here to copy to clipboard. RESEARCH RESOURCE: Changes in gene expression and Estrogen Receptor cistrome in mouse liver upon acute E2 treatment. Peroxisome proliferator-activated receptor γ and C/EBPα synergistically activate key metabolic adipocyte genes by assisted loading.